In PHP, interfaces allow you to define which behavior a class should have, but without providing the implementation of such a behavior. This is also called a contract: by implementing an interface, a class agrees to the contract terms. // Retrieves the service manager. // Retrieves the HTTP request object. // Retrieves the HTTP response object. As you can see from the example above, an interface is defined using the interface keyword, almost the same way you define a standard PHP class. As a usual class, the interface defines methods. However, the interface does not provide any implementation of its methods. In the ApplicationInterface interface definition above, you can see that every application implementing this interface will have method getServiceManager() for retrieving the service manager (about the service manager, see later in this chapter), the getRequest() and getResponse() methods for retrieving the HTTP request and response, respectively, and method run() for running the application. In Zend Framework 3, by convention, interface classes should be named with Interface suffix, like ApplicationInterface. The concrete Application class uses the implements keyword to show that it provides an implementation of all methods of ApplicationInterface interface. The Application class can also have additional methods, which are not part of the interface. Graphically, the class relations are displayed using inheritance diagrams. 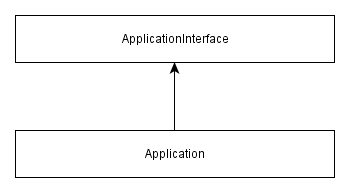 In figure 3.1, the diagram for Application class is presented. The arrow points from the child class to the parent class.